The mighty Mississippi, looking downstream. By Sunday morning, the French Quarter returns to its usual lazy self, devoid of most of its tourists (except the ones on the cemetery tour), and we felt more relaxed. 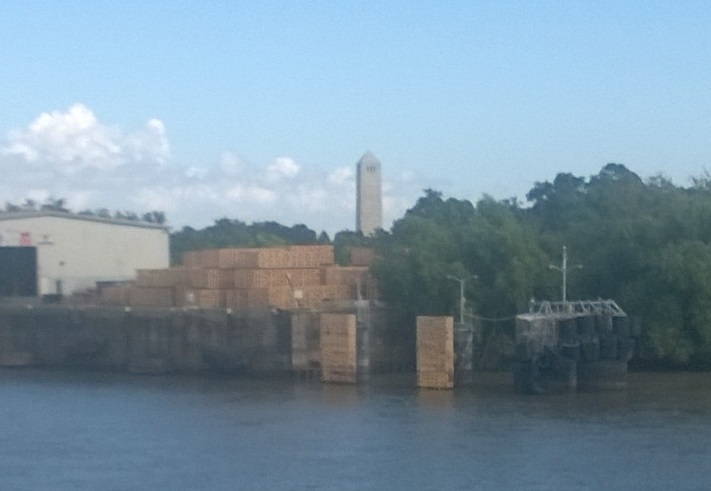 We ambled across to the Toulouse St. Wharf, where we would board the steamboat “Natchez” for a brunch jazz cruise. It was a hot day, or at least it felt like a hot day; I missed the cloud cover we’d gotten yesterday and the day before. Still, there was plenty of shade in the waiting area, and shortly we were herded aboard. They have a streamlined operation, checking tickets and bags and then tickets again with a speed that kept the line moving. 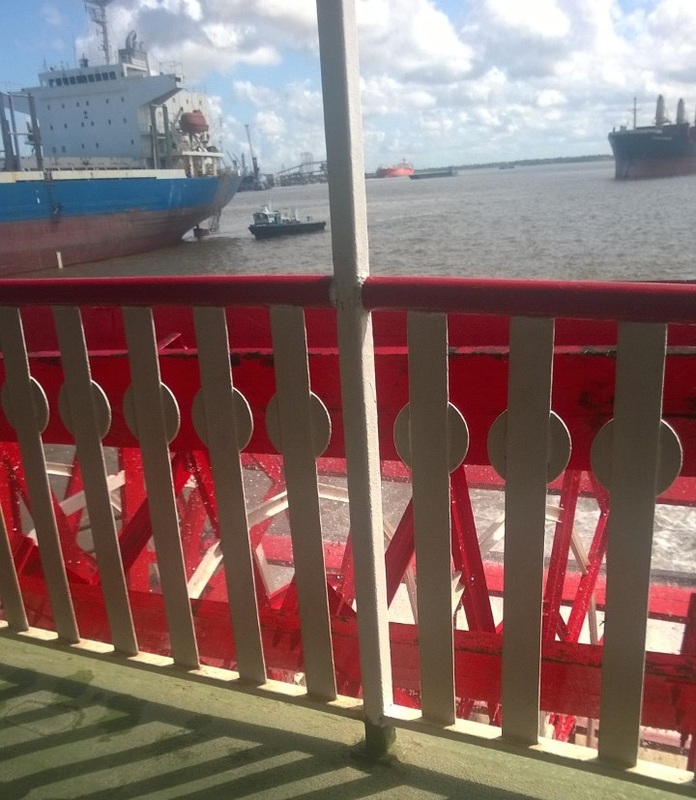 We settled in to our table with a view of the river–the wrong view, we soon discovered. We were on the “right” side (they don’t mess around with port and starboard for the tourists), which when you’re going downriver is on the wrong side of the boat to see all the things the tour guide talks about. But because we were aboard early, we ate our brunch quickly and found seats outside on the correct side. It was also the shady side. Good times all around. 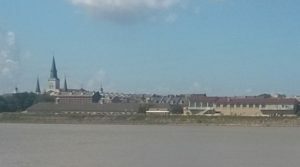 The French Quarter as seen from the Natchez deck. The Mississippi is a big, sprawling river, and we saw quite a few cargo ships going both directions. 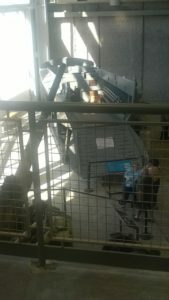 I don’t remember half of what the tour guide said, I was so preoccupied with watching for what might be coming up next. We went about seven and a half miles downriver, turned around, came back and turned around again, and I never got tired of watching the shoreline. 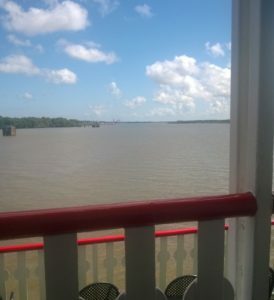 We probably should have switched seats when the steamboat turned around to return, since we were now in the sun, but I wanted to see the other side of the river. So we sat, and sweltered a bit, and marveled at what it must have felt like to those early explorers, coming across the river in their journeys. The paddle wheel of the steamboat. One thing we noticed that we never did remember to ask about was the lack of pleasure vessels on the river. The last time we were in Portland, we drove along the banks of the Columbia and saw fleets of yachts and houseboats, and that river is open to commercial traffic too. It was odd. 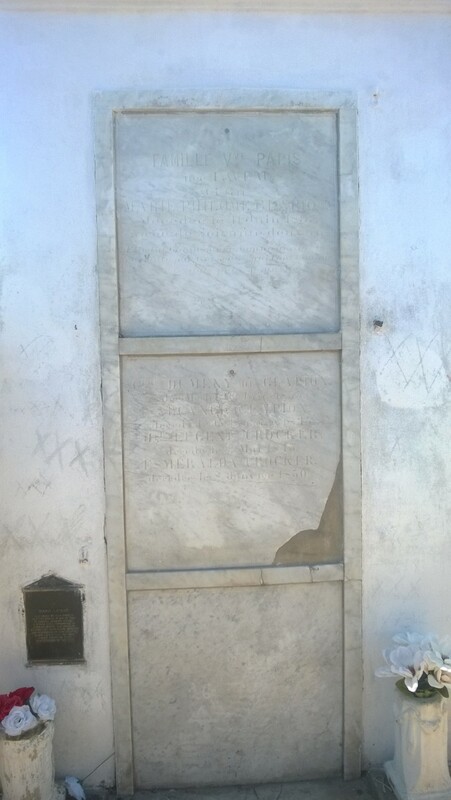 The Battle of New Orleans monument. It’s buried way back in there. We passed the site of the Battle of New Orleans, which has a bitty version of the Washington Monument, only it’s to Andrew Jackson and his troops. 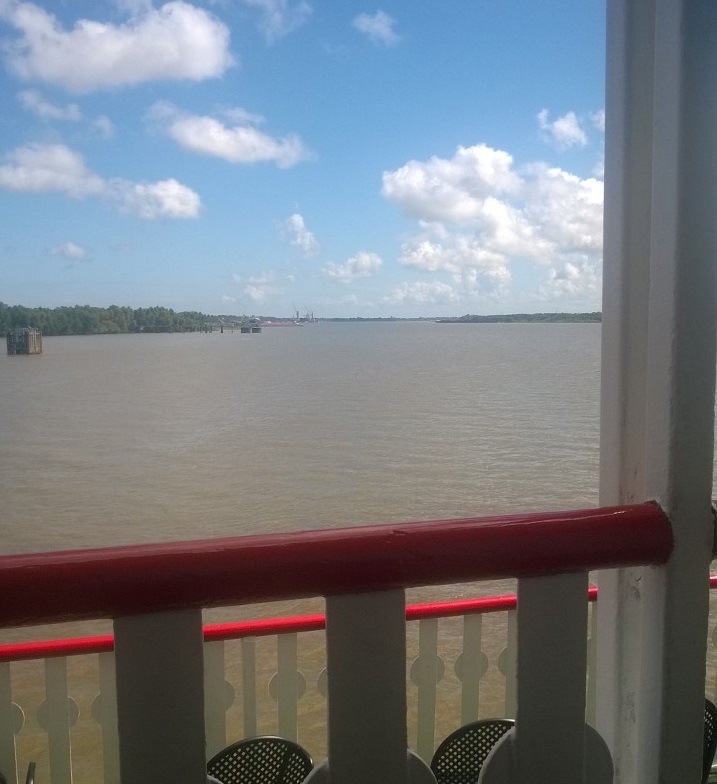 The tour guide also pointed out the Natchez’ “rival,” the Creole Queen. 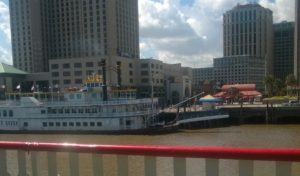 “It’s not a real steamboat,” he said, and proceeded to explain that it’s powered by a diesel engine where the Natchez has actual steam engines. We were glad we hadn’t been taken in by any phony steamboats. After the cruise, we walked upriver as far as the Riverwalk outlet stores, where we went inside briefly for some cool air, then walked back to our rooms by way of Canal St. Being the geniuses we are, we didn’t think to look for pedometer apps until two days ago, and it’s been amusing to see how they disagree with each other as to distance covered even though we walked the same route. They turn out to be sensitive to whether you’ve got the phone on your person or just tucked into your purse, and despite the unreliability, it’s been fun tracking how far we go. 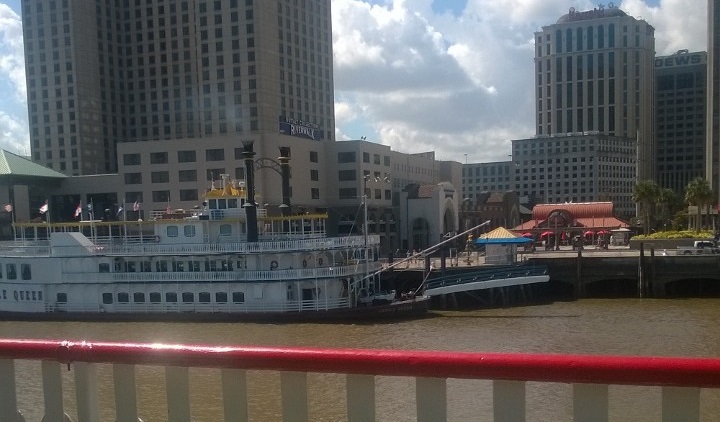 The “fake” steamboat, the Creole Queen. We read for a few hours until it was time to eat dinner, and the Plot Whisperer wanted to go to the first place he’d ever voluntarily eaten seafood. Seafood is a new thing for him, and still not a favorite, so when offered the seafood-free gumbo he leaped on it. I had shrimp etouffee and it was delicious, though now I’m craving red beans and rice. Tomorrow, we head home. It’s been a real adventure. These are some of the skeletons on the lawn. There were a lot of them. Today dawned overcast and sticky, enough to make me grateful we didn’t come here a month earlier. Humidity is draining. 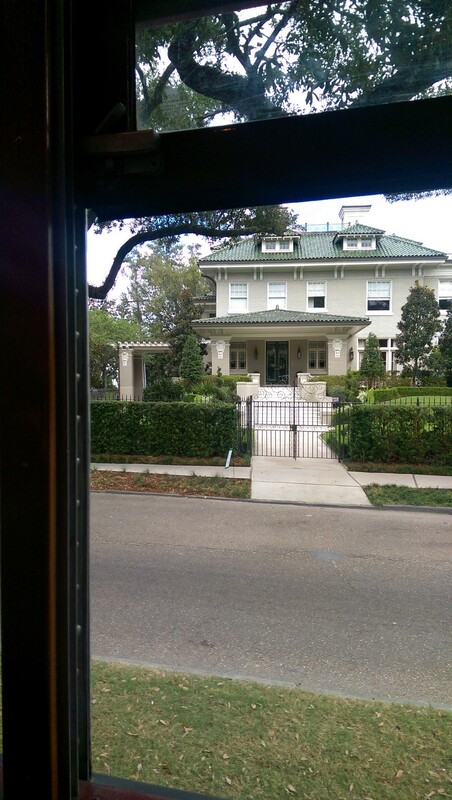 This, on the other hand, was a perfect day for riding the St. Charles streetcar through the Garden District, looking at the marvelous houses. Of course, most of New Orleans had the same idea, and we were fortunate not to have to wait long for a streetcar. We paid for a day pass and got a nice seat with a window and a strong breeze, comfortable even though the day wasn’t very hot. Some of them are more like mansions. I scoped out the ones I would like to live in, though there were surprisingly few I’d want to settle down in. 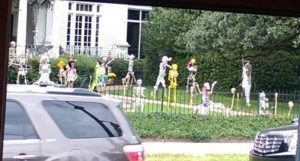 One mansion had hordes of people lined up along the sidewalk, looking at its elaborate pun-riddled skeletal Halloween display (“Marrow-lyn Monroe,” for example) There were also a ton of churches and a couple of synagogues. At a Jewish temple, a man was setting up greenery on a booth for Sukkot, which begins tomorrow. 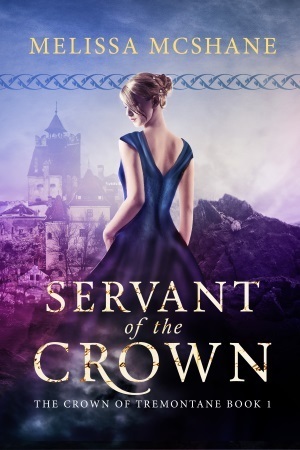 Many of the houses had been turned into apartment buildings, and a lot of those had women’s names, like Antonia, printed above the doors or in the front garden. It was a nice touch. I like the stairs. Very different. Our driver was some kind of speed demon, because we were chasing another streetcar the whole way up St. Charles until a supervisor told him to stop and turn around. This meant we all had to get off and go to the one ahead of us if we wanted to ride to the end, which we did. At the end of the line, we all got off again and waited for the driver to flip all the seat backs and start up the controls at the “rear” of the car, effectively turning it around without moving an inch. The driver was a little scary in her efficiency. I felt guilty about having a nice comfortable seat when I saw how many people were using the streetcar as actual transportation and not as a tourist vehicle. Most of them had to stand, and at one point the car was over-full of people. I wonder if they resented the tourists. 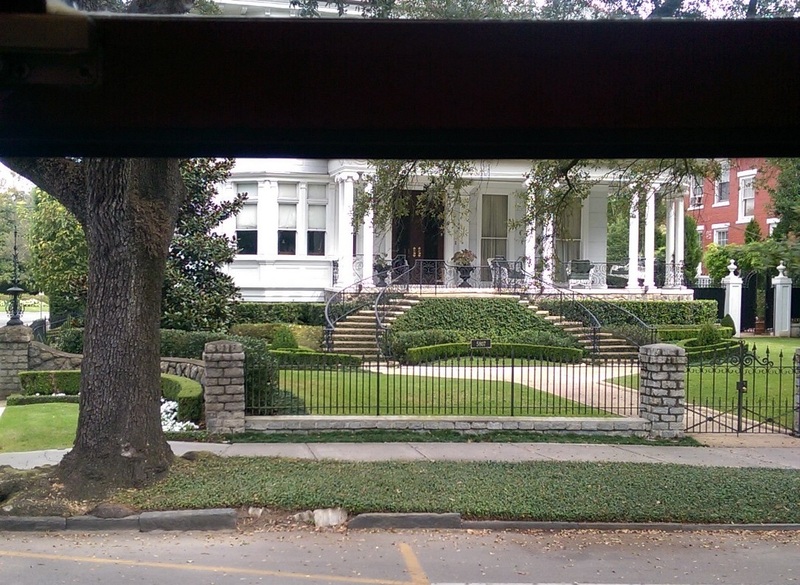 I certainly resented the tourists, once we left the streetcar at Canal St. and headed back into the French Quarter. 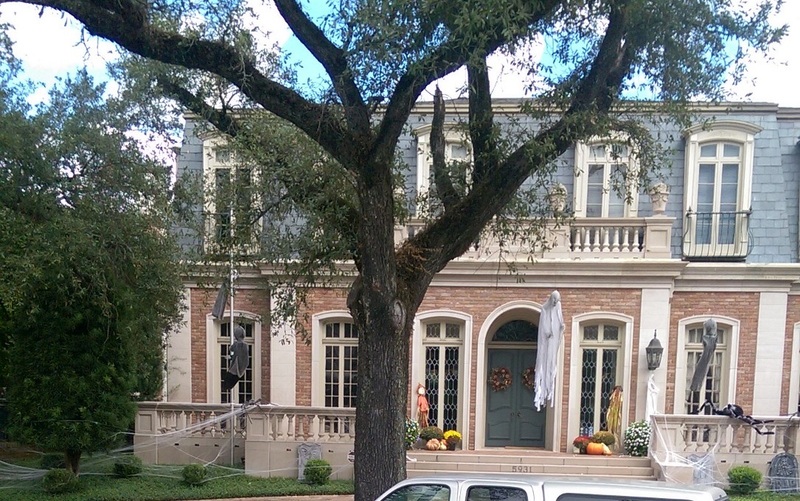 You’d pretty much have to decorate if you had a big house on St. Charles–even just a token couple of pumpkins. I don’t ever think of myself as a tourist when I’m here, though I do plenty of touristy things–I also shop at the local markets and avoid Bourbon St. So the flood of daytrippers that hit the streets on Saturday gets on my nerves. They clog the streets and fill up the restaurants and make walking around miserable. We ended up at Bubba Gump’s for lunch, one of the more expensive meals we’ve had, though it was delicious. The plan was to have lunch, get beignets for dessert, and finish our shopping for gifts. Unfortunately, the tourists had descended on the Café du Monde like a horde of poorly-dressed locusts. Café du Monde has a number of features that make it ideal for tourists: it’s famous, the food is good, and it’s the cheapest thing you can get in the French Quarter, with a plate of three beignets costing an even $3 (cash only). There was a line stretching from the entrance all the way back to the little amphitheater across from Jackson Square. We decided we didn’t love beignets that much and went to do our shopping. Having finished this, the Plot Whisperer suggested seeing what the line looked like now, just in case. And for a miracle, the line had completely disappeared. We hurried across the street and were immediately shown to a table that hadn’t even been bussed yet. We didn’t care. Full of seafood and beignets, we headed back to the hotel for a restful afternoon. I had enough of a headache I didn’t feel like facing the tourists again. We didn’t venture out again until 7, when we went to the Mona Lisa Restaurant for pizza and lasagna. On the way, we fell in behind a wedding party, complete with brass section and a bunch of guests waving little handkerchiefs. The bride was dancing. We left them at Royal St.; they turned right, we went left, and that was all we saw of them. Only in New Orleans, I suppose. On the way home from dinner, a pack of bicycles playing very loud music overtook us, and we had to weave through them as they waited at the intersection we were crossing. Their wheels were all woven with lights, an excellent precaution when riding at night, but here it just looked like a party. 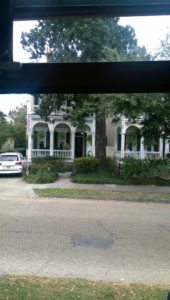 We’d also seen a Segway tour and a couple of walking tours, making me feel slightly guilty at not making the most of our New Orleans experience by doing as many tours as possible. Then I remembered I’m here because I love the city, not because of the tours. We stopped at the market for more Coke and ambled along to the hotel. Tomorrow, we have a jazz cruise and a quiet Sunday planned. I’m looking forward to it. 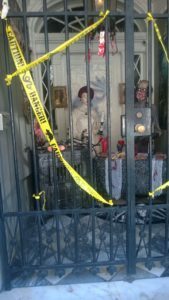 A Halloween “crèche” complete with audio of a demented doctor. This was a less-busy day for us. We saw a couple of small museum exhibits–very small ones. One was on currency, specifically antebellum, Civil War, and post-war currency of the South. What drew me to this one was their display of counterfeit currency and a digital copy of a booklet handed out to bankers of the period on how to identify counterfeit money. 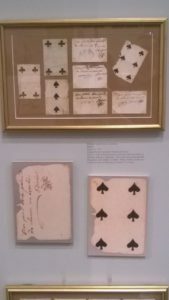 I wrote about counterfeiting in my upcoming book, Wondering Sight, and while this exhibit wouldn’t have made the book more accurate, it was fun to see the practical results of the counterfeiter’s art. Some of the bills were really realistic. 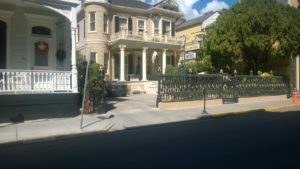 The Cornstalk Hotel. We almost stayed here. The fence has corn cobs on the posts, in case that’s not visible in the picture. After the museums, it was time for the real purpose of this day: shopping for souvenirs. Except we did our shopping on Royal St., which is known not only for its many art galleries, but also for its many shops. There’s a huge variety, with some of them being typical gift shops and others featuring local artists and artisans. I managed to leave the street with only a new pair of sandals and a blouse purchased from an Egypt-themed store that was tiny and adorable. I managed this feat by not going into any jewelry stores, though I’m regretting not buying the earrings at the Egypt store. We had lunch at Belle’s, which is a ’50s themed diner that also serves things like red beans and rice. The jambalaya had a great flavor, but was maybe a little too dry; I still call it a win. 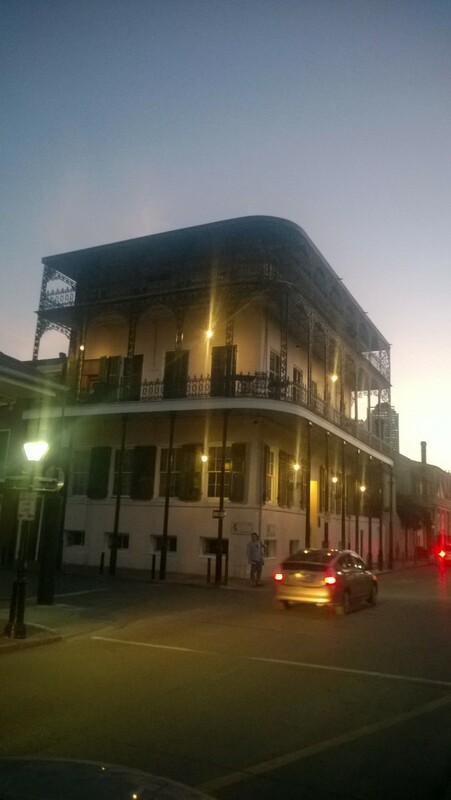 One of the many lovely buildings in the French Quarter. I like the ironwork on this one. After lunch, we had to hit the open-air market. This is a true tourist trap, not that we cared, and among the stalls that sold variations on the same thing we found a couple of unique items. I like shopping at places like this because the sellers are usually outgoing and dynamic in their efforts to sell you things. I don’t know why that isn’t annoying, since I hate the hard sell and will generally refuse to buy from someone who’s pushy unless it’s a deal I’d have taken regardless of their salesmanship. But it isn’t annoying. These guys had the right idea: keep the angel locked up. All of this meant a lot of walking, so we called it an early day and came back to do some work, then went out for dinner to a dive bar/diner that advertised Steak Thursdays–$6.99 for a steak dinner. I have this theory that some of the best food comes out of hole-in-the-wall eateries, so I had the steak dinner. I was half right; the mashed potatoes came from a mix and were flavorless, but the steak was tender and juicy and cooked exactly as I’d specified. The Plot Whisperer made the waiter/bartender get the weirdest look on his face when he asked if they had any lemonade. We might as well have had UTAH tattooed on our foreheads. Tomorrow, lunch with an old friend, and the much-anticipated bookstore crawl. I intend to locate the store that was the inspiration for the bookstore in my new series The Last Oracle. It has to be seen to be believed. This is a Douglas C-47. It’s really big. 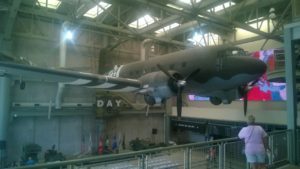 We set aside the whole day for our visit to the National WWII Museum based on our previous experience. Last time, we didn’t arrive until after noon, and barely had enough time to see the whole thing before it closed. It’s also an emotional experience, full of sensory overload, and I anticipated not wanting to do much else after we were done. So after breakfast at Mena’s Palace, we hailed a cab and were on our way. The interactive part of the museum exhibit is so interesting. They issue you a card, called a “dog tag,” and then seat you in a mockup of a train carriage for orientation, where you’re assigned a person from the war era who you follow as you go through the exhibit. And who did I get but Ernie Pyle, who happens to be one of my favorite writers and war correspondents. He’s quoted frequently in the displays, but the interactive tour had even more information on his contribution and death. Every so often there were kiosks where you’d tap your dog tag and watch a brief video about what your person was doing at a particular time during the war. There were also artifacts you could digitally collect, which were saved to your dog tag account for access later. It was a lot of fun (though for mine, the final segment “Life after the War” was slightly depressing, as Pyle was killed just days after the invasion of Okinawa and didn’t live to see the Allies’ final victory). We kicked around for almost an hour looking at the Merchant Marine display before heading in to see a movie called Beyond All Boundaries that was basically a history of the United States’ involvement in World War II, but touching on the personal as well as the military history. It’s advertised as “4D,” which means who knows what–there were tricks like rumbling seats and falling “snow” I was really grateful not to be under. 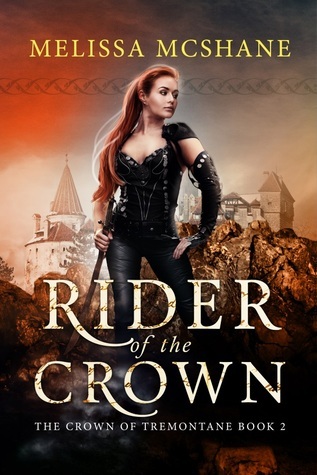 It was interesting, but a little too melodramatic for my tastes. 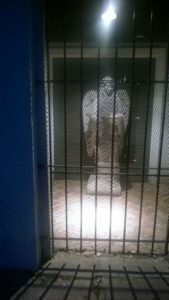 I prefer the more subtle drama of the exhibits, particularly the artifacts. I forget the specific type of boat this is. I just think it looks cool. So after the movie, we had lunch at the canteen (still haven’t had a truly bad meal) and then went on to the exhibits. The last time I was here, one of the visiting exhibits was on propaganda used by both sides, and it was fascinating. There wasn’t anything nearly so unusual this time, but the permanent exhibit is overwhelming in its content. I can see why this place is one of the highest-ranked museums in the country, because they know how to balance the mundane against the grand. And there’s just so much to see, even if (since it’s a US museum, after all) they only start with Pearl Harbor. There’s overviews of the battle and the Allied and Axis strategies, and snippets of the lives of servicemen and -women, and hundreds of artifacts, including a wall of guns my son would have appreciated. There are also contemporary film excerpts, some of which are extremely disturbing, like the liberation of the concentration camps. Piles of dead bodies in trenches, living skeletons who look even more emaciated next to their rescuers. That this was the work of human beings astounds me. At some point, I think part of me shut down. Like I said, it’s all so much, too vast for any one person to fully comprehend. So many people were involved in this war, all of them with stories to tell, that in some respects the museum’s purpose is futile. And yet what else can we do but remember? What struck me this time–actually, I remember thinking it the last time–was how what you take away from presentations like this one is ultimately very personal. I would like to think that anyone attending the museum would come away sickened and horrified and full of desire that such a thing never happen again. But it’s impossible to talk about World War II without commenting on the millions of acts of bravery, of men and women giving their lives or freedom for the sake of others, and I think there’s potential there for someone to see only that, to forget that it was great evil that made those sacrifices necessary. I hope I’m wrong about that. There’s also a display of the art of Tom Lea, who painted and drew many pictures of the war, a lot of which ended up in magazines or the cover of Time. Many of them were from the battle of Peleliu in the Pacific theater, and they are stunning and horrific and beautiful. My favorite is of an Army chaplain, approaching a dead soldier as his comrade covers his face. The look on the chaplain’s face is simply heartbreaking. Eventually, we were mentally and physically exhausted, and took another cab back to the hotel. I have a feeling this driver took us by a longer route, because it felt like it took much more time to get back, but he was a nice guy and we had some interesting conversation with him. We have no plans for tomorrow, though at some point the ritual Shopping for Souvenirs must happen. Fortunately, there are a ton of stores within walking distance. Surprisingly, I haven’t gone to any bookstores. Yet. 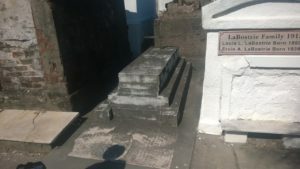 Marie Laveau’s tomb. There are still triple-Xs on its face, remnants of pilgrims looking for her blessing. Day Two began with hunting for breakfast, then wandering the streets until ten, when our cemetery tour began. Our tour guide, Renee, was outgoing and loud and very amusing. She was also very knowledgeable, and talked about several cemeteries aside from the one we visited, St. Louis #1. You can only get into this one with a tour guide. 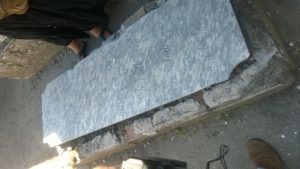 One of the oldest tombs in the cemetery. There aren’t many of these stepped ones around. It’s quiet, and surprisingly non-scary; I doubt it would be frightening after dark unless you’d just watched a terrifying movie. There are tombs missing their marble façades so you don’t know who’s buried there, though according to Renee they have plenty of records. I was fascinated by the wall graves, or ovens (they do look like pizza ovens), some of which have dozens of remains interred within. Then there’s the Protestant section, which by comparison to the Catholic side (what we usually think of as the St. Louis Cemetery) is weedy and empty. It was more unnerving than the lot full of tombs was. There are other famous people interred here, like Homer Plessy (of Plessy v. Ferguson fame, and Renee told us an interesting story about the descendants of Homer Plessy and John Ferguson meeting). 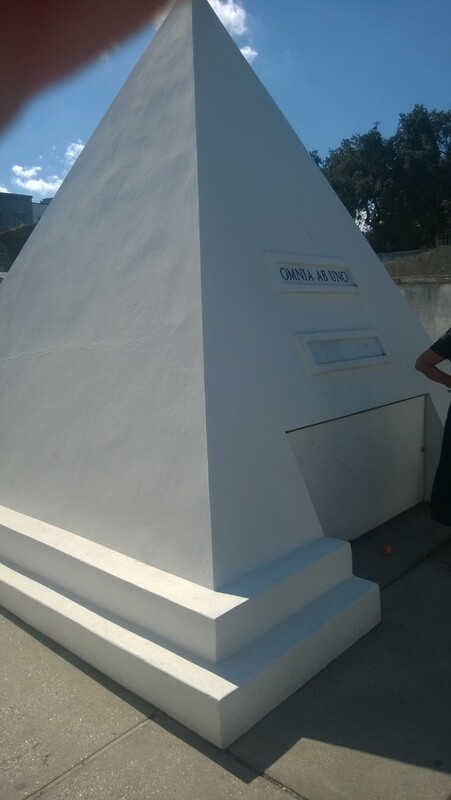 But, of course, no visit to this cemetery would be complete without a stop at the most famous tomb of all: that’s right, the pyramidal monument of Nicolas Cage. Nicolas Cage’s eventual resting place. It looks seriously out of place here. After the tour, we stopped for lunch at a sandwich shop on Bourbon Street, where I had the messiest, most drippy po’boy I have ever eaten. It was delicious, but I think I left half of it on the plate, the half that fell out with every bite. The place also serves po’boy ice cream sandwiches, which looked good, but we were too full to appreciate them. Maybe next time. This beautiful, fragile slab is a memorial to the 18-year-old son of some landowners. It’s just lying flat on the ground where anyone could step on it. After lunch was more museum time. The Presbytère and the Cabildo, flanking the cathedral, are both home to some of the state museum exhibits. 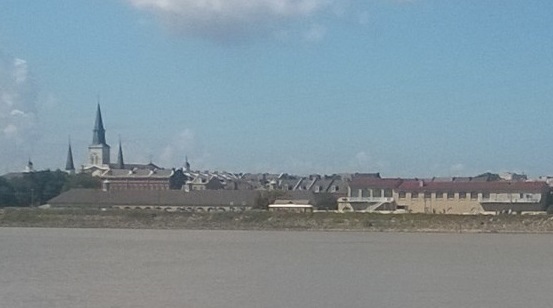 The Presbytère was originally built as a religious residence, though it was never actually used as such. It’s been part of the Louisiana State Museum for over a hundred years. The ground floor exhibit is about Hurricane Katrina and its aftermath; the second floor hosts an exhibit on Mardi Gras that I think is a permanent exhibit, because I remember seeing it on my last trip here. 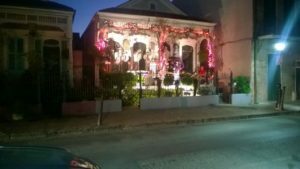 It’s the closest I ever want to get to Mardi Gras, but it’s fascinating–there’s a huge bin full of examples of the kinds of things they throw from the floats during the parades, not just beads but collectible plastic cups and trinkets and coins. And the costumes are beautiful. 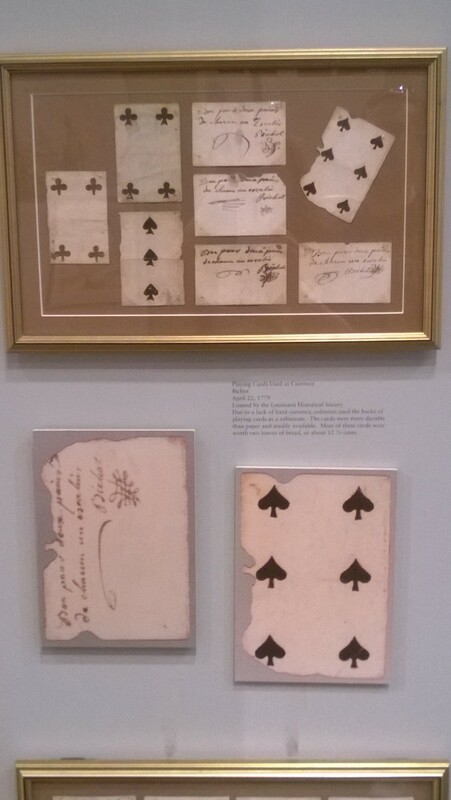 They sometimes used playing cards as currency. These have notes on the back indicating they’re good for two loaves of bread–about 12 1/2 cents. The Cabildo, or town hall, is on the other side of the cathedral. By the time we got there, I was getting tired, and the exhibit is really big and full of interesting stuff, so the details all blur together. 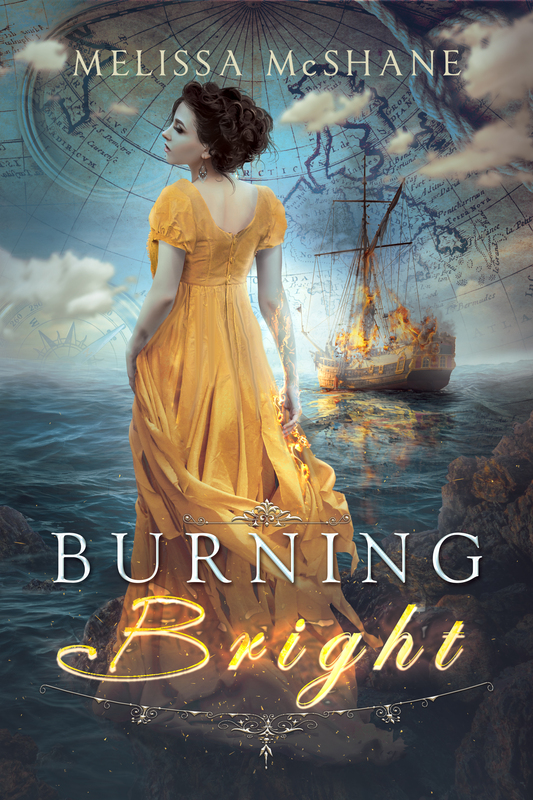 It basically showcases the history of New Orleans from its earliest explorers in the seventeenth century down to the early twentieth century. Some highlights: the playing card currency (shown left), the giant hamster wheel that’s actually the wheel for the big state lottery, a Civil War doctor’s chest complete with tools for post-mortem dissection, and a Baker rifle taken from the British 95th regiment (fans of Sharpe’s Rifles will recognize this). We were hurried along by a museum employee, who told us they were closing up soon–the state museum sites close at 4:30, so we were lucky to get through both in an afternoon. The St. Louis Cathedral, seen from Jackson Square. We thought about going to Muriel’s for dinner, but they weren’t open yet, so we crossed the street to Stanley, where we had some very fine gumbo with a really dark roux. Still no bad meals; even the messy po’boy was delicious. Then we went to the market to pick up snacks and more Coke. We stopped in at the vampire store (I don’t know its actual name, but “vampire” is in there somewhere) and I picked up a new Tarot deck and chatted with the guy running the store. It’s surprisingly non-campy despite the vials of fake blood and the wine bottles labeled with the “spirits” (get it?) of dead people. Then, home again for a long soak in the tub. Neither of us brought our best shoes for walking, though it was standing in front of the exhibits that really got me. Tomorrow, we will probably head out to the World War II museum. The last time we were there, we didn’t allow nearly enough time for the exhibits. We hope to get an earlier start tomorrow. 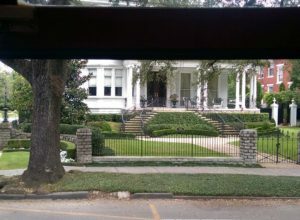 This house is just a couple of streets over from our hotel. 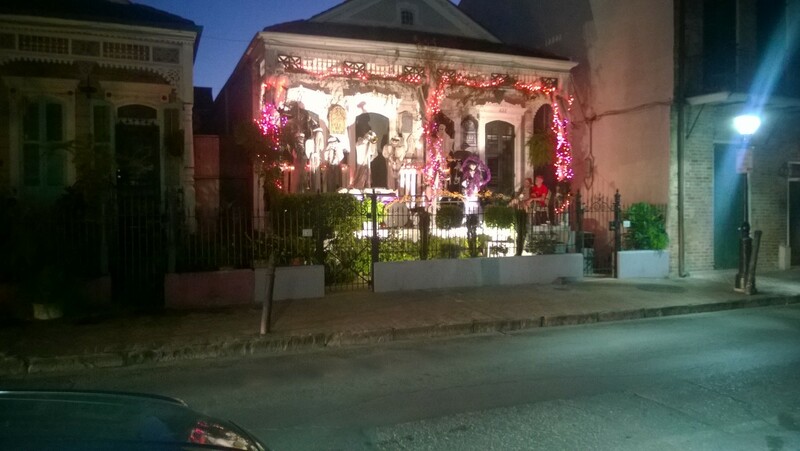 There are several of these much-decorated houses throughout the French Quarter. This year is my 25th wedding anniversary, which stuns me. To celebrate, my husband and I are in one of my favorite cities, New Orleans, for a week. The last time we were both here, it was June, which is a crazy time to go, and our anniversary is actually two days after Christmas, so we settled on October as a good not-too-hot time of year. It’s beautiful here, actually, particularly when it gets a little overcast and the breeze picks up. Getting to our hotel was not at all a given. Our taxi driver was going 80 on the freeway, in and out of traffic, and his little minivan (note: most of the taxis serving the airport are minivans) had no working seatbelts. So I pretended we were at Disneyworld and the driver was just a disgruntled dwarf working the Mine Cart ride. He did get us there in one piece, deposited us right at the door of the Inn on St. Ann. The Inn on St. Ann is near the edge of the French Quarter, within spitting distance of Louis Armstrong Park (which has a big ol’ arch over the entrance) and is in two parts: the Inn, and the Marie Laveau Annex. We’re staying in the Annex. The view from the door into our living area. There’s a refrigerator in the cupboard where I store Coca-Cola, one of Nature’s essentials when you’re out walking all day. Unfortunately, the Inn was locked up tight. Ringing the bell did nothing. The instructions said to go to their sister hotel, the Inn on St. Peter, if no one answered. So we picked up our bags and, after a short wrong turn, ended up at St. Peter, where they told us we were in the wrong place and of course there was someone at St. Ann. We trekked back in the company of a lovely Sherpa assistant, and they got us straightened right out. 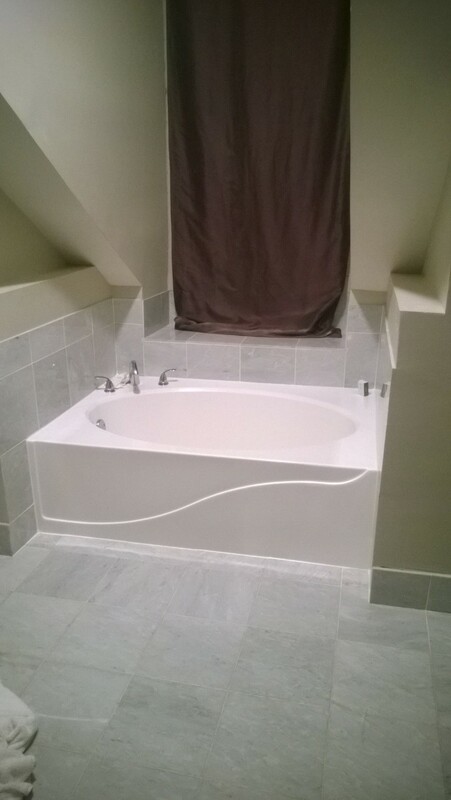 The garden tub. This was definitely not part of the original slave quarters, or whatever this building used to be. Our room is up two flights of stairs, but it’s worth it. 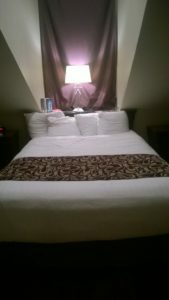 Bedroom, marble-floored bathroom, and a living area…just what I need for unwinding after a day of sightseeing. (I’m also supposed to be working on this vacation, so the computer came along.) There is a robust air conditioner right above the couch, so it’s downright chilly–very welcome after the heat of the day. It’s not terribly hot, but I was dressed for the weather in Salt Lake City and that was just a little too warm for trekking back and forth, dragging my little wheeled suitcase, carry-on bag, and purse. I worked up a sweat and was extremely grateful for the air conditioner. 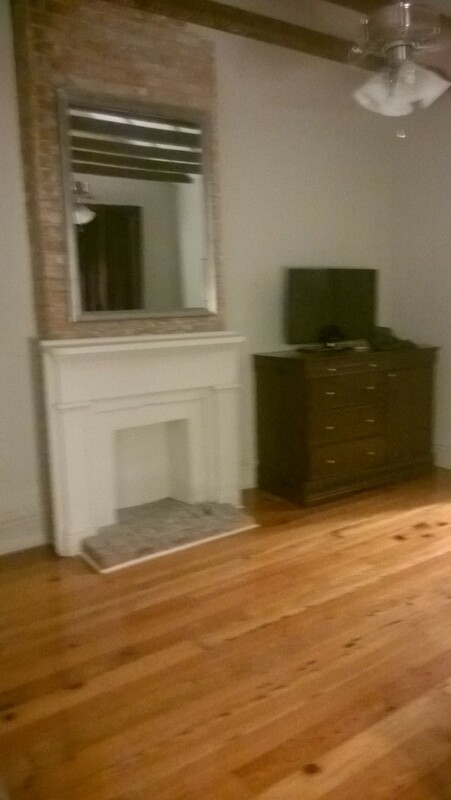 The bedroom. We’ve got a tangle of wires behind the headboard because we are hopelessly attached to our electronics. One of the things I observed on my last trip was that it’s impossible to find a truly bad meal in the French Quarter. This time I intend to see if that’s true. With Pere Antoine’s, it certainly was. I ordered red beans and rice with sausage–stick to the basics, I say–and the first bite nearly killed me, it was so good. I love how it’s served with the rice on the side so you can sop up the beans with as much or as little as you want. And the flavor…just the right amount of burn. The sausage might as well have been lagniappe–a charming custom of giving some little thing for free on top of your purchase. The Plot Whisperer, who is a creature of habit, ordered an omelet. But it came with the cousins of the sausage I had, and he said it was incredible–ten times as good as a regular omelet. 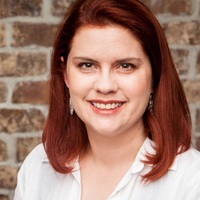 Fat and happy, we rolled out of Pere Antoine’s and decided we might as well go as far as the Café du Monde, though when we got there, we were too full for beignets–delicious puffy pastries dunked in about a gallon of powdered sugar. 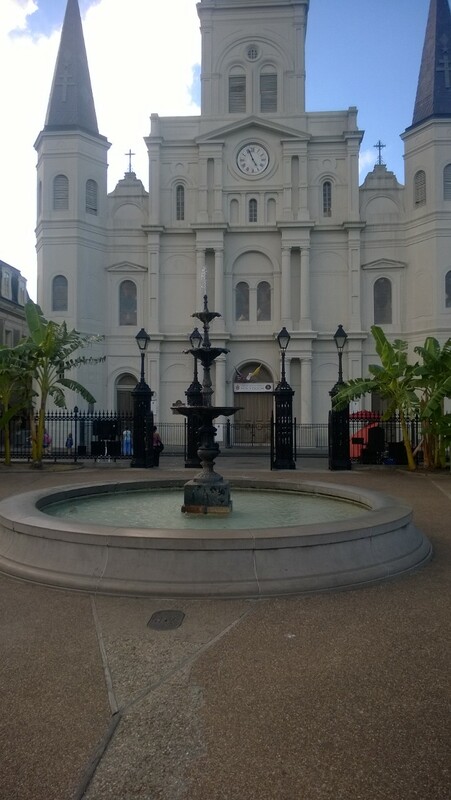 So we walked back, passing the cathedral and the buildings flanking it, the Cabildo and the Presbytere, both of whose facades are under construction. Fortunately, the museums themselves are open, so we’ll be going back. It was past twilight at this point, but the Tarot readers and palmists and Reiki experts were still at it around Jackson Square. I had to wonder how the palm reader could manage her craft in the near-dark, but she seemed content to simply enjoy the quiet evening. We returned to our room, tired and ready to call it a day even though it wasn’t much past 8 local time. Tomorrow we have a cemetery tour scheduled, and maybe a few more museums. Right now, I’m in the relaxed state I think most visitors to the French Quarter end up in, relaxed and content even if I’m not in a beignet coma. That day will come. 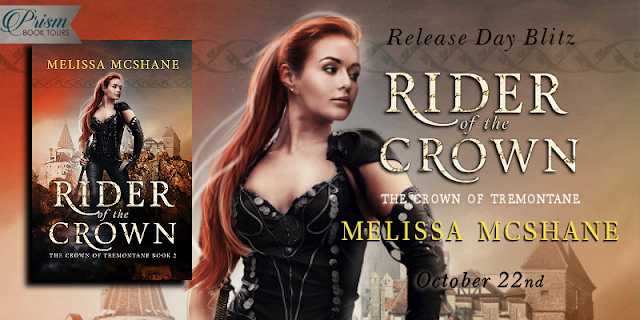 The release date is 8/15/16, and preorders will be available soon! Author MelissaPosted on June 6, 2016 Categories my novels, writingTags adventure, books, fantasy, female protagonist, historical, magic, pirates, regency2 Comments on Cover Reveal–BURNING BRIGHT!